Last year, we compared the iPhone X's performance to the Note 8 and found the X to be the clear winner. But with fresh internals from Qualcomm, can Apple's handset fend off Samsung's latest attempt at smartphone supremacy? Both the Galaxy S9 and S9+ models feature the same 8-core Qualcomm Snapdragon 845 processor, with four high performance cores and four efficiency cores. The Note 8 from last year had the same CPU layout, but in this year's silicon the high performance cores are clocked higher, and the efficiency cores are clocked slower. Both S9 models get an identical graphics chip as well, which Qualcomm says is 30 percent faster, 30 percent more efficient and has 2.5 times the display throughput than the graphics chip in the Note 8. The most significant difference between the two Galaxy models is that the S9+ gets 6GB of RAM compared to only 4GB on the regular S9. The iPhone X on the other hand, has a 6-core A11 Bionic processor with two high performance cores and four efficiency cores. For graphics, the iPhone X uses an Apple designed three-core GPU, which boasts 30 percent faster performance over the GPU used in the iPhone 7 models. The main drawback is that iPhone X has 3GB of RAM, only half that of the S9+. Apple's operating system is very efficient, but Samsung definitely has the upper hand in terms of raw capacity. Starting off with Geekbench 4, the iPhone X completely destroys the S9+, especially in single core performance. 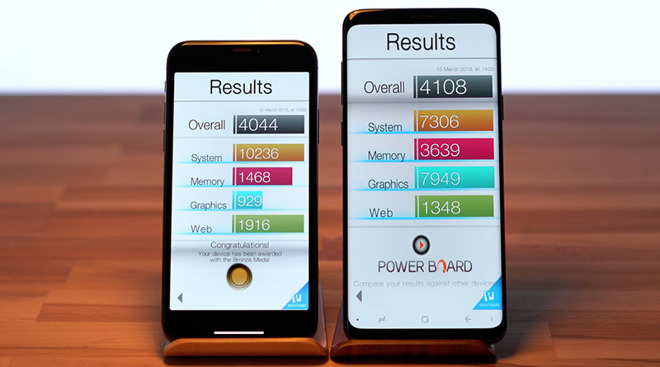 The iPhone came in with single- and multi-core scores of 4,243 and 10,433, respectively, while the S9+ managed scores of 2,007 and 8,307. For the graphics test, the S9+ scored 14,308, very close to iPhone's 15,177. A score like this is big news on the Samsung side. Moving onto the Antutu benchmark, the S9+ actually beats out the X by a good margin, with respective scores of 263,661 and 211,652. For Samsung, the boosted results are thanks to the massive improvements Qualcomm put into its graphics chip. 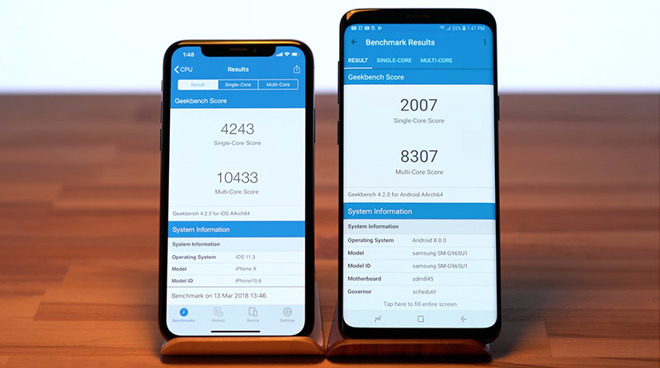 Antutu's HTML 5 test crowned the iPhone X as the winner with a score of 37,461, not that far off Samsung's 33,924. 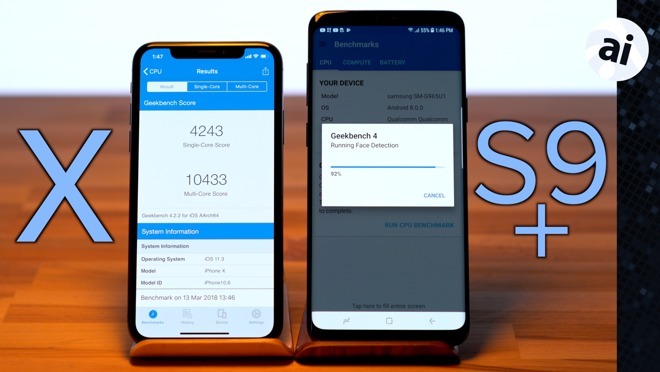 In Basemark OS2, the S9+ came out just slightly ahead with a score of 4,108 compared to iPhone's 4,044, but if you take a look at the detailed test results, you'll see that the iPhone X won in every category except memory. This result makes sense considering the S9+ has double the RAM of the iPhone. In GFXBench OpenGL's 1080p Manhattan Offscreen test, the iPhone X is slightly ahead with a score of 5,463, compared to 5,106 on the S9+. The iPhone X completely destroys the S9+ in the Jetstream browser benchmark, but the test is mostly a comparison between each operating system's default browser. For iOS, results won't change using an alternate browser since Apple requires developers to lattice in WebKit, but it is possible that the Galaxy S9+ might fare better with third-party software. In Octane 2.0, another browser benchmark, the iPhone X yet again floors the S9+ with respective scores of 33,683 and 11,682, so we can see just how good Safari is compared to Samsung's browser. Since the S9+ boasts improved WiFi connectivity, we decided to test the speed using the Speedtest app. There was basically no difference at all since we are running off of slow business Wi-Fi in a city that doesn't support fiber internet. Other reviewers in big cities that do support fast internet have seen incredible Wi-Fi download speeds on the S9+, though we were unable to confirm these reports. 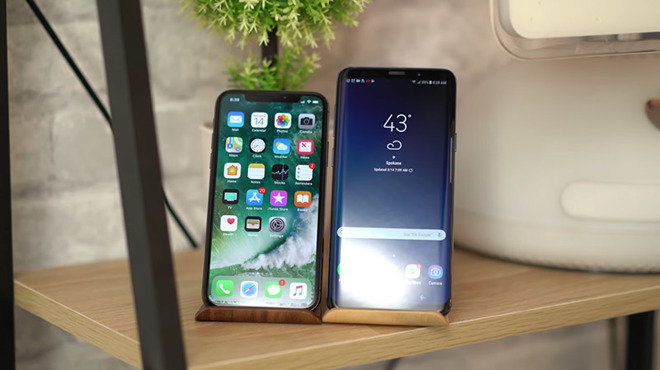 Looking at the sum of our benchmarking evaluation, it seems Samsung has mostly caught up to the performance of Apple's flagship — with some notable exceptions. Performance on both devices has reached a point where it should no longer affect your decision-making process when deciding between an iPhone and a Galaxy device. Most of the extra bandwidth is now used for unique features like 4K 60 frames per second video recording, augmented reality processing and biometric authentication, like Face ID and Intelligent Scan. If you're trying to figure out which phone to buy, we recommend basing your decision on the features and operating system you like the most, as raw performance is no longer a determining factor.